Pick Analysis: It would be foolish for team to be wary of selecting Buckner because of the lack of success of former Ducks defender and number three overall pick Dion Jordan, as he's a completely different type of player. The 2015 Pac-12 Defensive Player of the Year, Ted Hendricks Award finalist and member of multiple All-American squads (first team USA Today, second team AP, etc.) presents a thicker frame, portending an NFL career with his hand on the ground, rather than a stand-up pass rusher like Jordan. Buckner had become a name to note as a 2014 second-team All-Pac-12 pick (led team with 13 tackles for loss) after two seasons as a partial-year starter; he had 29 tackles and two starts, playing in every game as a true freshman in 2013, followed by a eight-start sophomore season (3.5 tackles for loss, 2.5 sacks). He finished off his career in style (83 tackles, 17 for loss, Pac-12 leading 10.5 sacks), putting himself among the top prospects in the senior class. Published: April 28, 2016 at 09:07 p.m. The San Francisco 49ers draft Oregon defensive end DeForest Buckner with the No. 7 pick in the 2016 NFL Draft. Published: April 11, 2016 at 04:03 p.m.
Get to know former Oregon defensive end DeForest Buckner, a top prospect heading into the 2016 NFL Draft. Published: April 28, 2016 at 10:58 a.m.
Oregon head coach Mark Helfrich talks about defensive end DeForest Buckner and the skills he will bring to the NFL when he is drafted. Published: March 15, 2016 at 03:14 p.m.
Watch Oregon defensive lineman DeForest Buckner workout at the 2016 NFL Scouting Combine. 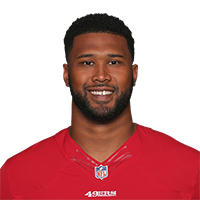 Published: Feb. 26, 2016 at 06:37 p.m.
What kind of player is DeForest Buckner? What his combine confessional to find out. Published: April 26, 2016 at 05:03 p.m. Check out some highlights of Oregon defensive tackle DeForest Buckner.